Play 4-of-a-kind on the Ones. Play 4-of-a-kind on the Twos. Play 4-of-a-kind on the Threes. Play 4-of-a-kind on the Fours. Play 4-of-a-kind on the Fives. Play 4-of-a-kind on the Sixes. Play 4-of-a-kind in every top box. Play a Pentad on the Ones. Play a Pentad on the Twos. Play a Pentad on the Threes. Play a Pentad on the Fours. Play a Pentad on the Fives. Play a Pentad on the Sixes. Play a Pentad in every top box. Play 100 games of Pentadee. Play 500 games of Pentadee. Play 1000 games of Pentadee. From the good book of Whedon, chapter 6, verses 23 through 64. He was ever so fond of linguine. There you are, minding your own business, and BAM, another one! Play a Pentad on Crowd of 3. Play a Pentad on Party of 4. Play a Pentad on Advantage. Qualify for the Top Bonus. Pen a score in every box. Win 10 games against 1 or more opponents. Win 50 games against 1 or more opponents. Win 100 games against 1 or more opponents. Commander of the good ship Pentad. Master of the Pentadian fleet. Win with a score of more than 300. Win with a score of more than 325. Win with a score of more than 350. Win with a score of more than 375. Win by a margin of more than 80. Win by a margin of more than 160. Win by a margin of more than 240. Win by a margin of more than 320. Play Pentad on Full House. Play Pentad on Streak 4. 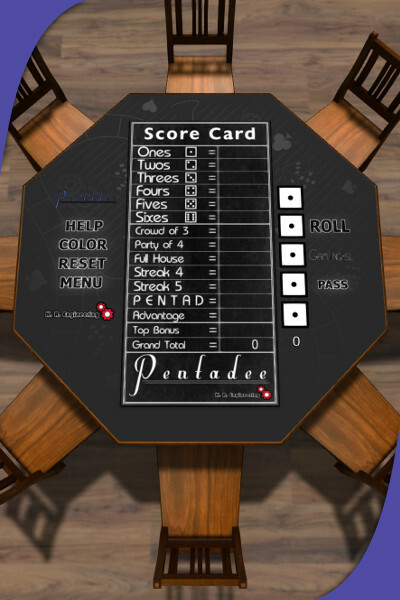 Play Pentad on Streak 5.